Tonight, tune in to History Television Canada for the Season Two premiere of the Kensington production Museum Secrets, an educational show which travels all over the world in search of the world’s greatest museums. The series is unique in that it tells of stories behind objects at museums that the history books don’t tell. From spectacular photography in the museums and their hidden spaces to experiments conducted by leading researchers and people personally connected to the objects, Museum Secrets is sure to captivate people of all ages. And I'll have you know that the show is produced by a small team right here in Toronto! Recently nominated for 2 awards from History Makers International, Museum Secrets has previously been nominated for a Gemini and a Rocky Award for their work on the TV series and the cross-platform components. Their new website contains webisodes and previews of upcoming episodes. In this season's premiere, they travel to St. Petersburg with a young Canadian professor from Toronto as he completes his homage to ancient Scythian mummies’ body art, after reading of their discovery deep below the permafrost of Russia. Also included is an art history story about the significance of one painting and one artist who was an influencer of the modern minimalist art movement. Our stories take us beyond the public galleries, into hidden places visitors are rarely allowed to see: a vast storeroom where millions of once-living creatures float in formaldehyde, a noisy workshop where curators in hard-hats piece bones together into skeletons of colossal dinosaurs. When a story moves outside the museum, we follow: to the grounds of a medieval French chateau to recreate a fatal jousting accident, and down into a 50 foot hole in the Egyptian desert to stand inside the tomb of Ramesses the Great. 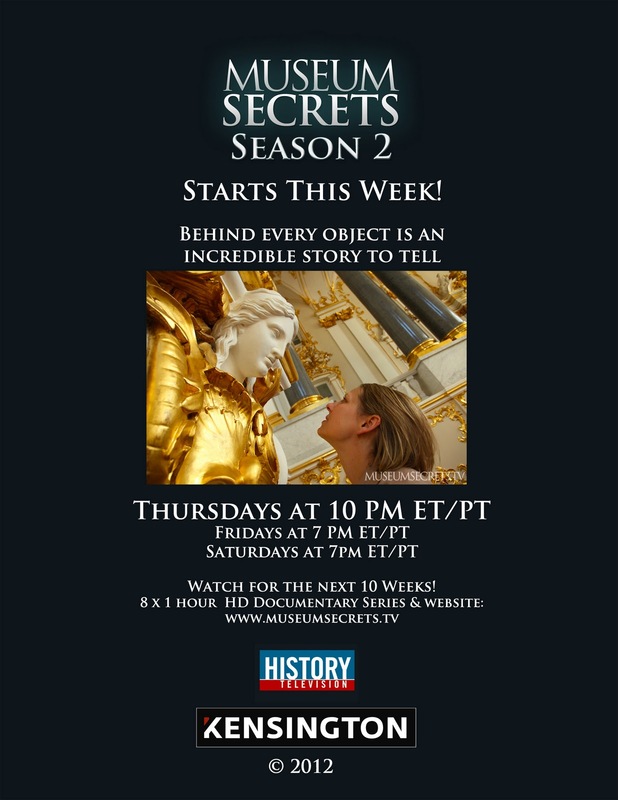 Tonight I plan to attend the Season 2 launch party to learn more about the series and to speak with the show creators as well as watch the first episode Museum Secrets: Inside the State Hermitage Museum. Colm Feore, acclaimed Canadian actor, is the narrator of the series and he has been invited too. His recent work includes the great Canadian TV series, The Borgias (CTV, Showtime, 2011), and the movie Thor (Paramount Pictures, 2011). If you're on Twitter, you are invited to join us as we tweet live from the launch using the hashtags #museumsecrets and #socialtv. In the meantime, check out the behind the scenes at the Black Square Shoot vlog on their blog. I will also leave you with the trailer for Museum Secrets below. Be prepared to be intrigued.